Zen Surf Morocco offers a guided surf camp so that you will have the best experience possible as an experienced surfer eager to surf the best spots around. When you aren't surfing, you can take full advantage of Zen Surf Morocco dream Banana Beach surf house where you can either relax on the terrace on a deck chair or have a mint tea on the balcony watching our gorgeous sunsets over the ocean in pure Moroccan style. The longer you stay, the better you get, and the faster you’ll want to come back! You will be staying in Zen Surf Morocco's beach house which is a nice Moroccan house with an inner garden and a beautiful terrace facing the beach and the ocean. This will give you a few nice options for the sunrise and the sunset yoga! You can choose between staying in a comfortable bedroom with a beach or inner garden view, or in a nice and cozy wooden roulotte (beautiful hand-crafted caravan) with a view of the ocean, for those willing to nurture the bohemian part of their soul. The house offers a rooftop terrace with panoramic ocean view offers you deck chairs to relax in the sun after a tough surfing session or to read a book while listening to the sound of the waves and enjoying a delicious mint tea. This is also the place where the sunset yoga session takes place, there is no better place to practice your asanas while watching the sun set over the Atlantic ocean. It also has a typical Moroccan lounge with a long table, the perfect place to socialize with other guests and share your surfing experiences of the day. Equipped with a large flat screen with satellite TV, you will be able to watch video replays of your day of surfing, watch TV, or enjoy a movie from the comfortable sofa. This is one of the most original features of our camp: the roulottes! With a beautiful sea view, they have been designed to provide optimal comfort while keeping this unique “out of time” feeling that will satisfy the adventurous souls. They are equipped with a double bed, a fan, a mini-bar, and a private shower cabin with hot water, a washbasin, and squat toilets, providing you great comfort in the coolest retro atmosphere. The bedrooms are nice, cozy and decorated with taste, and have an ocean or inner garden view. You can choose either double or single bed configuration. They are located in independent apartments with all modern comfort: broadband Wi-Fi, TV, bathroom plus separate toilets, and a kitchen for those who prefer to cook for themselves. You can choose either the shared or single occupancy option. Please note that private bedroom occupancy is possible for a supplement. Please contact Zen Surf Morocco for the same. The seven-day surf guiding package is designed for surfers looking for total peace of mind with everything will be taken care of. You will be guided every day to the best spots for your ability, from Agadir and even Imsouane (for the latter, Zen Surf Morocco kindly ask for a little supplement). Zen Surf Morocco surf guides have a deep knowledge of the area and will make sure you surf the right spot at the right time. Your safety will always be the highest priority, and the surf guides will surf with you and tell you everything you need to know about the specific spot configuration (rips, winds, rocks, sandbanks, and more). The Taghazout area is one of the best places on earth to learn surfing because it hosts many spots that are sheltered from big swells, thus delivering all year-round small and easy waves to progress in total safety without dangerous rips. As a beginner or intermediate level surfer, you will be guided every day to the best and safest spot for your ability. Zen Surf Morocco accredited surf instructors will guide you through each step of the learning process to optimize your learning curve. Specially designed for beginners and intermediate levels, the surf teaching program will focus on teaching you the art of surfing a wave safely and in a fun way, taking your level and your experience with the ocean into account. Zen Surf Morocco will do their best to give you one obsession after your trip: coming back! To make sure you have material suitable for all abilities and all tastes, Zen Surf Morocco has a very wide range of quality surfboards available for you. The choice of boards is critical if you want to spend the best surfing holidays on a surfboard adapted to your ability, weight, style, and taste. On top of this, with the increasing costs of flying with your own surfboard, it becomes less and less affordable to bring your surfboard with you on your surf trip, with the risk of having it damaged by luggage carriers. Renting a board is a great alternative, and we offer very affordable prices for great quality surfboards. Zen Surf Morocco offers three types of boards: softboards, epoxy surfboards, and polyester performance-oriented shortboards and longboards. You can rent epoxy surfboards up to 8’2 for 10 EUR per day and 15 EUR per day for polyester performance surfboards and 9’0 epoxy longboards. Please note that as a special discount the rental is half price for guests choosing this package. This surf camp will take place in Banana Beach between Aourir and Tamraght, in the North of Agadir, Morocco. Zen Surf Morocco welcomes you in the most laid-back place in the whole area of North Agadir. They are wonderfully located right on Banana Beach in front of the renowned Banana Point, a great spot for both beginners and experimented surfers. 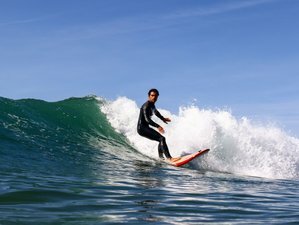 The North of Agadir has a unique coastline hosting some of the best waves Morocco has to offer, from the world-famous Anchor Point and its powerful right-hander to the relaxed Imsouane Bay for longboarders. This package includes daily breakfast, lunch, and dinner. With Zen Surf Morocco you will experience the best of the Moroccan traditional cuisine, which is both for vegetarians and meat eaters: Moroccan breakfast (Moroccan pancake or eggs with vegetables, fruits from the market, cereals, yogurt), lunch picnic-style on the beach (sandwiches or salads), traditional Moroccan dinner (tajine, couscous, seafood, barbecue, salad), and barbecue every Wednesday. Please note that Zen Surf Morocco can also accommodate for gluten-free and vegan diets. Take advantage of Zen Surf Morocco sunrise and sunset yoga classes. Yoga has many benefits for your body and mind, one of which is making you more fit and flexible before the morning session. It will relax and stretch your muscles after a full day of surfing to make you recover faster. Once you’ve tried it, you can’t live without it! Each session costs 10 EUR, and you can buy a five-session pack for 40 EUR. The North of Agadir hosts picturesque berbère villages, namely Aourir, Tamraght, and Taghazout, the latter being considered as Morocco’s surfing “Mecca”. The region is culturally rich, and when out of the water, you will be able to make the most of the delicious Moroccan cuisine and maybe enjoy a massage, go to the hammam, or visit the Agadir souk (market) to take a beautiful piece of Moroccan handicraft back home. Zen Surf Morocco surf & yoga camp welcomes you in their dream location in the south of Morocco near Agadir for the ultimate surfing and yoga experience!